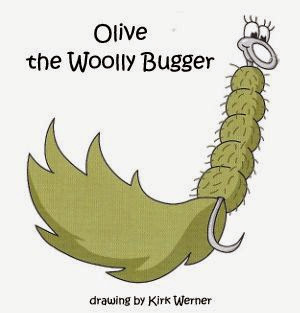 This is a second life for Olive the Woolly Bugger. This time it is a laminated business card with the tracking code displayed prominently on the face of the card and a message on the back. In the first life, this travel bug was a piece of paper inside a film canister, green body, red top, attached to an actual TB. I launched Olive the first time in Estes Park, CO in July 2010. It disappeared sometime in 2012 after having logged 3,199 miles and 63 posts. I pulled back the travel bug number and relaunched Olive in GC4J5BY, Paradise Point, in Milton, PA on 19 Jun 2014. I guess there is some slim chance that the original might show up. The Woolly Bugger is one of the most versatile flies on the planet. It can imitate a leech, minnow, crawdad, stonefly nymph, cranefly larva, and probably a hundred other organisms. Most typically fished as a streamer with a fast, jerking retrieve in rivers and with a slower, steady strip in lakes and ponds. Olive is one of twelve characters created by artist Kirk Werner for three books designed to introduce children to fly fishing.